Rules set by global governance organizations affect communities across the world. Such organizations increasingly seek to obtain legitimacy in the eyes of groups beyond their member state elites. This book advances scholarly debate on the politics of legitimacy and legitimation in global governance. It brings together researchers from different subfields of International Relations in order to highlight trends and contradictions in the contemporary politics of legitimacy across areas of sustainable development, humanitarian relief, responsible investment, sustainable fisheries and labour standards. 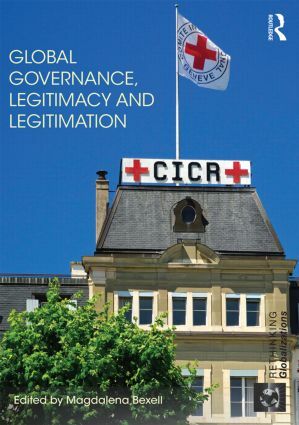 The chapters explore legitimation efforts by various forms of global governance bodies, such as intergovernmental organizations, public–private partnerships and fully private bodies. The book demonstrates that different governance forms beyond the nation state share deep legitimacy challenges and engage in continuous legitimation attempts. Questions on the audiences of such legitimation attempts are particularly pivotal in understanding the politics of legitimacy. Audiences are not predetermined but constituted through interaction between legitimation efforts and the reactions to those of targeted and other groups, mirroring broader global power relations. Magdalena Bexell, PhD, is a senior lecturer at the Department of Political Science at Lund University, Sweden, and a former Pro Futura Scientia Fellow at the Swedish Collegium for Advanced Study in Uppsala. Her research revolves around questions on global governance, legitimacy, public–private collaboration, human rights and development. Among her publications are articles in Globalizations, Global Governance, Innovation, International Feminist Journal of Politics and the co-edited book Democracy and Public-Private Partnerships in Global Governance.